If the future of our economy is depending on natural resources then the future is depending on Alberta oilsands. Boom or bust they are here to stay. With 400 years of oil reserves until we start making cars that run on water the world is looking to Alberta to produce Food Fuel and Fertilizer. "Feel it? Suddenly, there's a buzz in the air. Alberta's big, bad oilsands are back in vogue. Oh, don't get too excited -- or aggravated, depending on how you feel about North America's biggest, messiest industrial project. 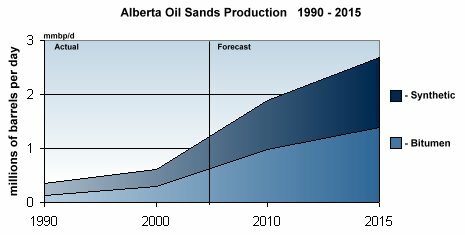 The oilsands boom isn't coming back anytime soon. At least, not in its original, chaotic form. No one is predicting a sudden gusher of overlapping, poorly planned megaprojects, a brand new influx of tens of thousands of foreign temporary workers, or a rapid rebound to $147-US-a-barrel oil prices. In fact, another spike in prices(however unlikely) is the last thing anyone wants. That includes OPEC, which sees the current $75 to $80 price range as pretty close to optimal."